In this activity, students will learn a few simple commands and then convert their Painting Turtles program into a Bumper Turtles program in which agents respond to their environment. Start with the StarLogo Nova model Bumper Turtles starter. 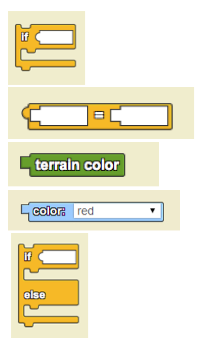 This starter model already has a push button called “Paint Landmarks” and some code associated with it. Click on the “Paint Landmarks” push button and see the program execute the code provided. Note: DO NOT make changes to the “Paint Landmarks” procedure. Your challenge is to make the turtles react to the landmarks created by the “Paint Landmarks” procedure, following the same rules laid out in the Trailblazer activity. Test your project to see that it works as expected. The (something is true) part is called a BOOLEAN expression or an expression that evaluates to TRUE or FALSE. (Mountain Lion nearby) could evaluate to TRUE or FALSE. CONDITIONAL STATEMENTS and BOOLEAN expressions work together. The THEN part of the CONDITIONAL STATEMENT only gets executed if their BOOLEAN expression evaluates to TRUE. Another type of CONDITIONAL STATEMENT is the IF/THEN/ELSE STATEMENT. With this kind of statement the THEN part gets executed if the BOOLEAN expression evaluates to TRUE. The ELSE part gets executed if the BOOLEAN expression evaluates to FALSE. Think about when this might come in handy…. What if you were the coyote and had a rabbit and a mountain lion in front of you at the same time. How would you use the IF/THEN/ELSE command to make sure you take the right action? Post a screen shot of your project and a link to it in your portfolio in the section "SLNova Projects->SL Nova - Intro" under the heading "Bumper Turtles." Reflect on using Boolean expressions and Conditional statements. Post your reflection to your portfolio in "Reflections->CS Concepts" under the heading "Boolean expressions" and "Conditional statements."